Some parents cope with school holidays by sending the spawnlings on camp, or to grandparents. Other parents team up and share the ‘babysitting’ around – amateur hour. At some time, it’s your turn to have a dozen or so 10-year-olds all at once. The trick is to have one day of slothenly indulgence. Recharge the creative juices, start the eye-brow re-growth, and bring all the incessant whining and begging to one day. 1. Everyone wears pyjamas. Pyjamas will restrict you from going out, encouraging you to stay home and chill out. 2. Each person is allowed one indulgence food – chocolate, bag of lollies, ice-cream, whatever. No limits, no questions, no sharing if they don’t want to. 3. There is no “get out of bed time”. In fact, there’s no set time for anything. 4. Computer games and movies are all good, with one condition – first choice goes to the best relaxation/viewing point. 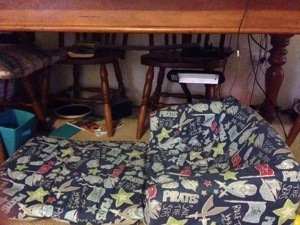 Designs include but not restricted to lounge forts; table caves; bean bag craters. Technological enhancements are bonus. 5. The day after Pyjama Day is outside. No screen time. No argument. It’s good. It’s very good. It’s exactly what holidays are about. To chill out. To relax. To reset to juices. And afterwards, you can rebuild that volcano-lair. With sharks. Yeah, sharks. This entry was posted in Managing Evil Genius Inc. and tagged holidays, kids, pyjamas. Bookmark the permalink.